Hi! My name is Jenn and I'm a writer for Arcadian Home Decor, an e-commerce website that specializes in top home decor ideas around the world. I've been writing about home decor for years and love antiques, unique table decor, stylish home accessories, and much more. Every morning I sit down at my desk with my latte and look for great home decor and interior design blogs, and a personal fave is Kyandra - the posts are so inspiring, and I'm thrilled to be writing here today! 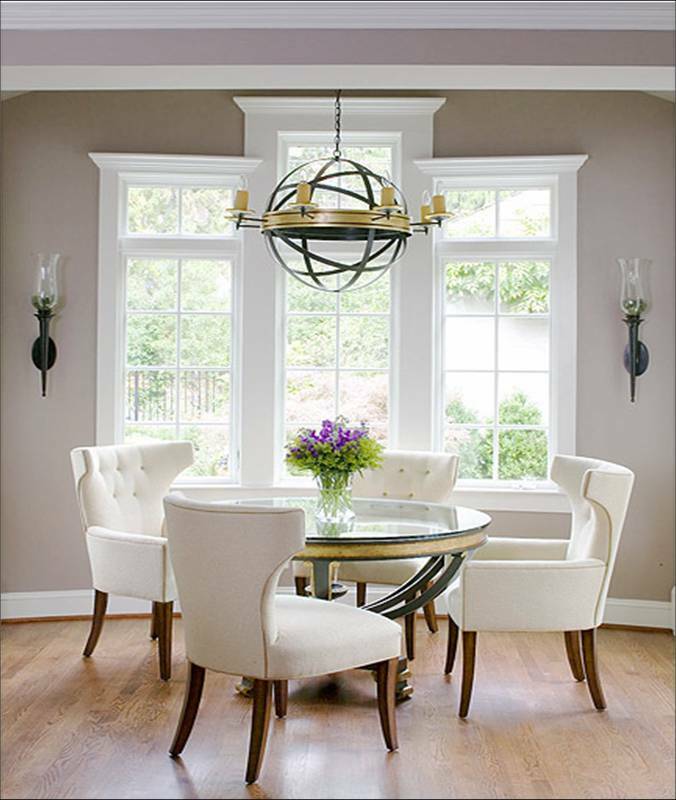 A refurbished piece of furniture can totally transform the look of a room, and a dining room is no exception - the trend today is to have chairs and tables that may not necessarily match, which only adds to the personality of the space. 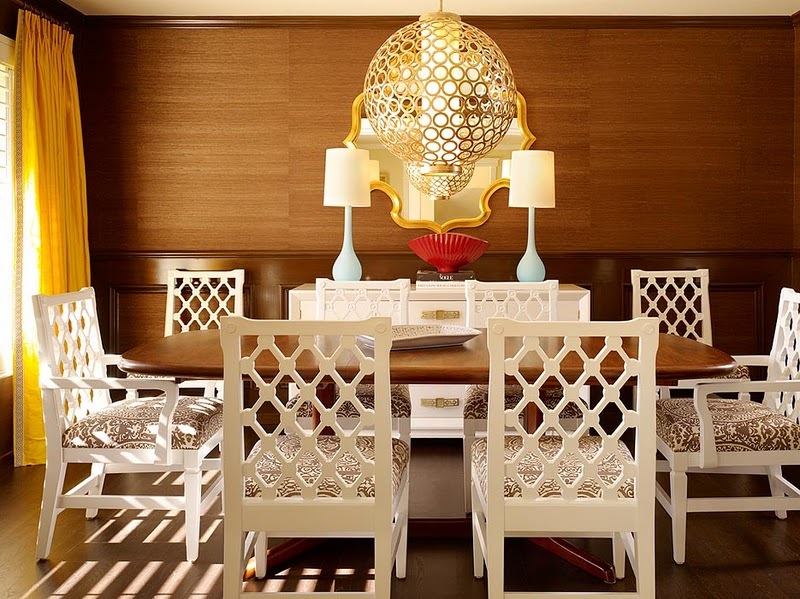 Here are eight fab dining rooms with refurbished chairs. The wood chairs here have been restored to their original splendour however the coloured cushions are a welcomed change and can be swapped out for other colours anytime. Sometimes a new layer of fabric is all that's needed to up the style factor of a dated dining room, like here where the chairs are now in plush white velvet. This mid-century dining room is given a new lease on life with supple eggshell material that was professionally slip-covered and then tufted. A spacious farmhouse dining room table in wood is accented by painted white chairs, which look crisp and clean in this family-friendly space. 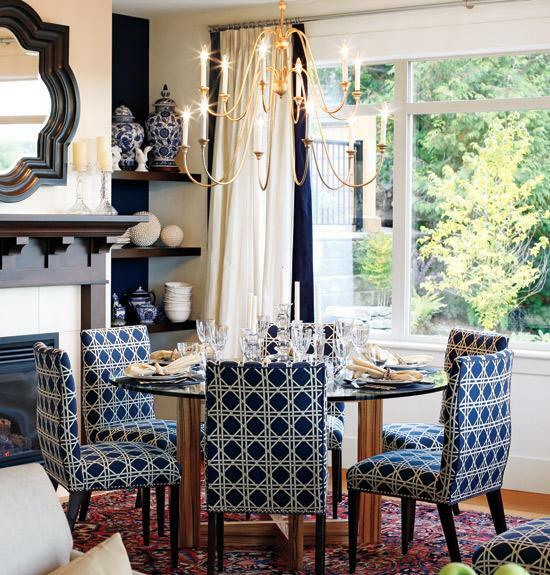 A bold pattern such as the diamond one seen here becomes the focal point of the dining room and inspired the navy blue in the table decor as well as the drapery. What's black, white, and red? 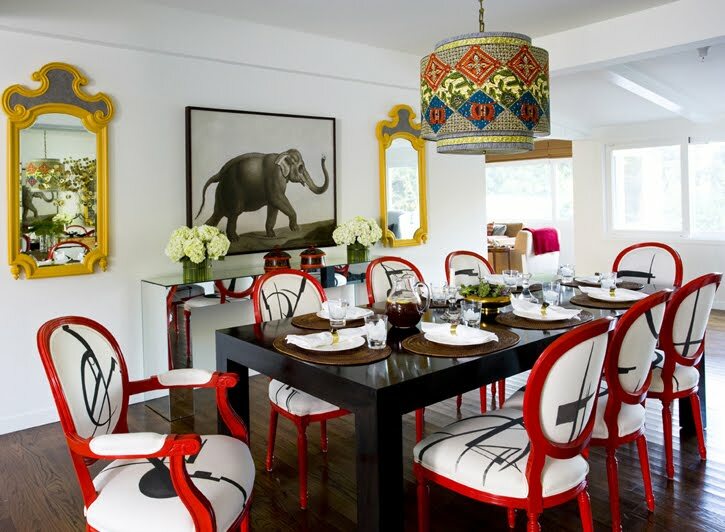 While many homeowners may not be brave enough to go this route, this fab dining room with refurbished red, black, and white chairs is exotic and lively. Recovered chair cushions revitalize these once-tired chairs, and although the lattice-work pieces are white, they still look great with a wood table. Blue velvet and interesting hardware takes these refurbished chairs from drab to fab, while the antique mirror wall hanging gives the room dimension. Content provided by Arcadian Home Decor, a site that specializes in top quality home accessories at extremely affordable prices! What a lovely post! 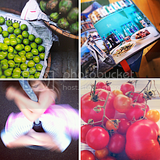 I love all the images they've picked out - so sophisticated and gorgeous!! And how is your painting getting on?